"A delicious, moist, full-bodied seasonal treat! 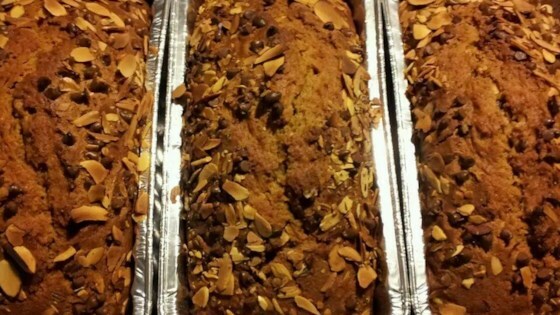 This pumpkin bread is for those looking for a huge hit of holiday flavors to share with friends and enjoy themselves. Also an excellent gift idea, or as an addition to any fall/winter potluck gathering." Beat sugar, pumpkin, vegetable oil, eggs, and molasses together in a large bowl. Whisk flour, baking powder, baking soda, salt, nutmeg, cinnamon, and ground ginger together in another bowl. Add flour mixture to pumpkin mixture and stir until batter is well-combined. Stir 2/3 of the almonds and 3/4 of the chocolate chips into batter. Pour batter into prepared loaf pan; sprinkle remaining almonds and remaining chocolate chips over the top of the loaf. Bake in the preheated oven until a toothpick inserted into the center of the loaf comes out clean, 45 minutes to 1 hour. Try mixing up the addition of the almonds and chocolate to just dark chocolate chips, or chopped pecans, or some sort of dried fruit; the options are endless. Also the bread is delicious enough without anything added to it at all!